Abstract: Hodgkin lymphoma (HL) represents ~11% of all lymphoma cases. This disease occurs in young adults, but also affects people over 55 years of age. Despite the fact that >80% of all newly diagnosed patients under 60 will achieve a sustained complete response (CR), 5%–10% of HL patients are refractory to initial treatment and 10%–30% of patients will eventually relapse after an initial CR. The treatment recommendation for primary refractory or relapsed HL patients is salvage therapy followed by high-dose chemotherapy and autologous stem cell transplantation. Following this approach, a significant part will still relapse at any moment. Thus, further research and new drugs or combinations are required. Overexpression of COX-2 has been associated with poor prognosis in relapse/refractory HL patients, so it could be a potential therapeutic target in HL. For this purpose, several drugs may have a role: specific COX-2 inhibitors such as celecoxib or other anti-inflammatory drugs such as lenalidomide may further inhibit lipopolysaccharide-mediated induction of COX-2. Moreover, lenalidomide and COX-2 inhibitors (celecoxib) have been tested in solid tumors with encouraging results. 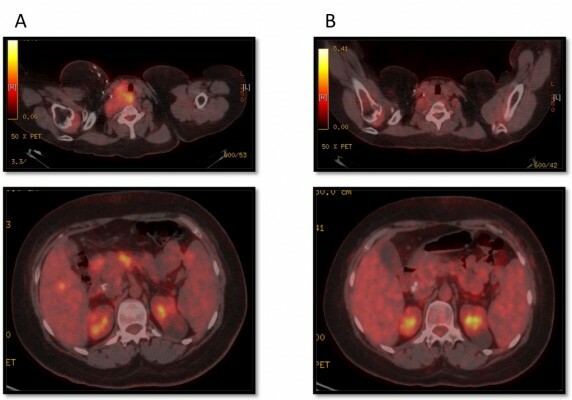 We present a case of a young female diagnosed with a heavily pretreated HL nodular sclerosis subtype who, after failing six treatment lines, only achieved clinical and radiological CR after six cycles of lenalidomide/celecoxib that resulted in an event-free survival of 22 months. We explain the rationale of using this chemotherapy regimen and our patient follow-up.